In a move that is sure to rile up the “Breaking Bad is just a sequel to Malcolm In The Middle” crowd on the Internet, distracting them from whatever important work they were going to do today, Malcolm star Jane Kaczmarek confirmed she’ll join her erstwhile TV husband in the remaining hours of his newer series. 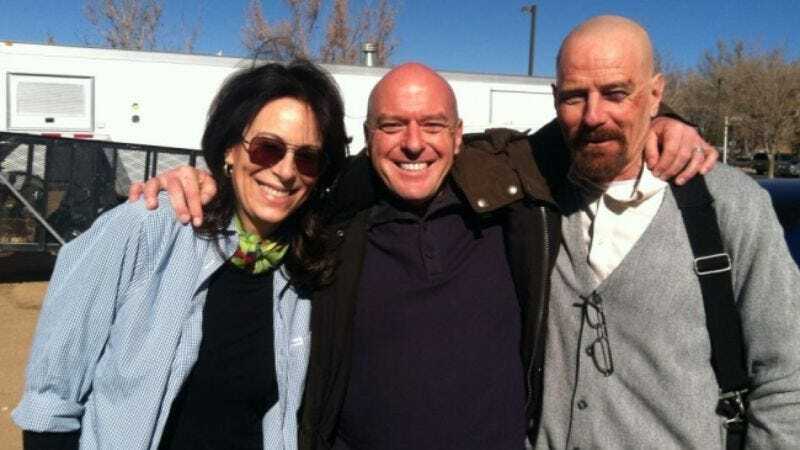 Kaczmarek’s Sunday night announcement backed up some other recent evidence, including an IMDB listing that has her appearing in the 11th and 12th episodes, and the above photo (captioned “Hankum In The Middle”) tweeted by Dean Norris. However, today Vulture attempted to quash the story, before it caused everyone to question their own reality, quoting “a source at the show” who says Kaczmarek’s appearance will only be for the DVD extras, not in the actual episodes. But clearly that’s all just a diversion from the show’s real plan to go out with a Newhart-style ending, with a cozy Vermont inn replaced by a crystal meth empire, and “Walter White” forced to end that beautiful daydream and return to his far less powerful, far more stressful life as the father to a family of horrible children.